Headhunters are people who help career professionals find new (or first-time) jobs in their chosen profession. They can place people with large behemoths like General Motors or small national (or local) businesses including firms with 100 people or less. Essentially, a headhunter is someone who works in the field of human resources as a kind of free agent. Depending upon the industry, a headhunter might only spend time actively seeking out an individual to fill a job opening. This is often the case in financial services (where people command salaries in the high six-figures) or when a headhunter is tasked with filling a senior-level position for someone with an established career. Media headhunters are those individuals that exclusively work to place people in jobs in the media industry whether it's working at a newspaper, magazine, TV station, ad agency, or PR firm. A media headhunter might find you, but it's more likely you'll need to do the legwork and find them (unless, of course, you're at that point in your career where you can command a high six-figure salary). While it's ideal to work with someone in our area so you can meet face-to-face, don't shy away from those outside your immediate geographic area. Narrow your search by looking for a media headhunter with positions that not only appeal to you but are in your designated area. Similar to a media careers counselor, who helps people figure out what it is they want to do, a media headhunter can offer advice on your job search and give you tips about your resume. The value of working with a media headhunter is that you have a skilled professional aware of job openings (ones that you're probably unaware of) and they'll help you get a job, for free. Your first meeting with a media headhunter is no different than a job interview. While your headhunter meeting will feel more like you're on equal grounds, you still need to comport yourself with the utmost professionalism. Dress the part and be prepared to answer the kind of questions you'd be asked on a job interview. 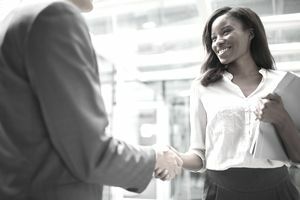 It's imperative you make a good impression with the headhunter because (initially) he's the one standing between you and the organization you want to work for.